These substations transform electricity from (usually) 11 kV to the supply voltage for homes, 230 V (also described as 400 V). In urban areas there is one to every few hundred houses, in rural areas they are smaller still, often mounted on poles, and serve just a few homes. There are over 400,000 substations in the UK - more on numbers of substations. The metal fence round an outdoor substation or the cabinet or building structure for enclosed substations usually ensures that no electric fields are produced outside the substation. The equipment inside a substation - particularly the busbars and switchgear, less so the transformer - produces magnetic fields. But the field falls with distance, and usually, the field at the perimeter fence may be slightly elevated but falls to background levels within a few metres. This means in most cases a substation is not a significant source of exposure in homes. But sometimes, if the substation is right next to a house, it can be a reason for the field in the home being elevated. This is most true for substations built into a block of flats or other large building where it can be just the other side of a wall from a public or residential area. This does happen but is relatively rare in the UK. The design of substations varies. The individual items of equipment in outdoor substations tend to be relatively compact, and modern substations are often a "unit" design where the transformer, switchgear and fuseboard are all bolted together in a single unit, which is even more compact. But indoor substations can be laid out more spaciously - the frame with all the fuses can be spread over a wall, and the busbars may be fastened to a wall or ceiling fairly well spaced. So, sometimes, these substations can produce higher magnetic fields than most substations. See more detail on substations inside buildings. 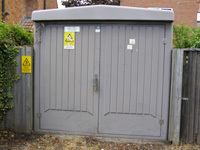 National Grid surveyed 25 final distribution substations in suburban areas in Surrey in the 1980s. Mean magnetic fields close to the perimeter fence were about 1.5 μT, falling to half this in an average distance of 1.3 m and becoming indistinguishable from the background due to other sources within 5 m.
Grainger and Preece (2000) [see abstract below] surveyed substations in four areas round Bristol. The average value of the field at the closest public access to the substation ranged from 0.3 - 1 μT and at 2 m from the substation mean fields were typically 0.02 μT. Maslanyj (1996) [see abstract below] surveyed 27 substations in Oxfordshire. The mean magnetic field against the boundary was 1.1 μT. Distances for the field to fall to 0.2 μT were 0-1.5 m and to fall to 0.05 μT were 1-5 m.
Int J Environ Health Res. 2000 Dec;10(4):285-90. The contribution of local distribution substations and associated area distribution system to personal exposure to power frequency magnetic fields. A number of epidemiological studies has shown a significant correlation between wire coding, magnetic fields and childhood cancer, although a more recent study has not [McBride et al. (1999) Am. J. Epidemiol. 149 (9), 831-842]. In the UK there is currently no equivalent to wire-codes and there is some uncertainty about the extent to which the UK medium-voltage electricity distribution systems contribute to personal exposure and how this compares with US overhead supply systems. Studies on four different area types were carried out to measure magnetic field intensities from typical electricity supply utility substations and cabling in the vicinity of domestic housing. Typically at distances of two metres from the substations mean magnetic field intensities were 20 nano teslas (nT) or less, increasing to 0.98 microT or less at the closest public access point. The mean magnetic field exposure level sampled around the four main test areas varied between 0.012 and 0.27 microT increasing to 0.30-0.80 microT at road junctions. Local area substations are the components of the distribution system which convert electricity at 11 kV to 415 V and thereby provide the link with the domestic electricity supply. They are sources of magnetic and potentially electric fields. Representative substations in south Oxfordshire were surveyed in order to characterise the magnetic fields around enclosure fences. Some of the sites were revisited in order to measure the associated electric fields. This report describes the results of the investigation.